BIO: Amanda-Lee Diane was raised in the small country town of Sundown, Manitoba. Her parents, Gary and Brigitte, brought up Amanda-Lee and her older sister Kimberly-Ann in a Christian loving household. Throughout the years, Amanda-Lee has developed a strong faith in the Lord. Amanda-Lee is currently employed and works in the area of Copy Point, for Goldenwest Radio, in Steinbach Manitoba. She is also responsible for various other tasks such as music scheduling and voicing commercials. Amanda-Lee enjoys keeping active, and often can be found working out at the gym in her spare time. She also loves dance and is currently attending hip-hop classes. Amanda-Lee loves to participate in all sports including everything from snowboarding, water skiing, soccer and basketball to badminton and dragon boat. She also has a passion for music and is currently learning to play guitar. Amanda-Lee’s goal in life is to inspire others and is passionate about displaying the change she wishes to see in the world. She believes that when one volunteers their time, the benefits received by those in need are immense, but also recognizes that those who give the time are also affected, if not more. I am fluent in English. I started learning sign language and hope to develop even more. I love the outdoors and spending time with my family. We usually camp in the Lake of the Woods area, and I love everything the lake has to offer. I have graduated the Panache Model and Talent School. And I am also enrolled in hip hop classes and guitar lessons. I have participated in all of the following sports; soccer, basketball, badminton, track and field, dragon boat, snowboarding, skiing, skating, water skiing, knee boarding, swimming, volleyball and curling. I would have to say that I look up to my sister the most. She has finished 5 years of University and is a top athlete for the University of Manitoba Track and Field team. With a lot on her plate she still always finds time for her little sister and keeps God first. I am proud of graduating from Panache’s Model and Talent School. I come from a small town and I always dreamed about doing something like that. The most interesting thing that I was involved with, was being an extra in the Don Cherry movie. It was so much fun doing a little bit of acting, and seeing what really goes on behind the scenes in movies. A little unique thing about me would have to be that I have not consumed any alcohol in my life, and plan on not doing so in the future. My goal is to help out or create an organization that helps children and their families with poverty. By volunteering and learning the ropes of how a non-profit organization manages and also getting my name out there will hopefully help me achieve my goal. I would love to travel the world and with every person I meet along the way I hope to inspire them. I would love my days to be filled with volunteering and helping those less fortunate. That to me is living each day to the fullest. I work at Goldenwest Radio, where I work as a Copy-Point person and I also schedule music, and do little tasks on the side such as voicing commercials. I was raised in a small town, Sundown Manitoba where we spent a lot of time outdoors. I was raised with a great work ethic, being from a country town, which helps me everyday in my life now. Working at a radio station is definitely interesting. I always learn something new everyday. It is really neat to see how radio works behind the scenes. Every year I help out wrapping Christmas presents at Southeast Helping Hands and also help pack the hampers. I also volunteer at Anna’s House, which is a family resource center dedicated to helping expectant parents and families with children up to the age of 5. I love styling hair. Instead of my family and friends going to a hair dresser for fancy hairstyles, they usually come to me. I also have a lot of knowledge when it comes to the different types and kinds of makeup, as I used to be a cosmetician. I would have to say snowboarding at Big White in British Columbia was very interesting and so breath taking! It was an amazing resort and I felt so blessed to enjoy the view and the mountains! I would love to be working in an organization that helps child poverty, because I strongly feel if we give children a good start in their lives, their potential can be so bright. I think the questions that were asked were perfect. 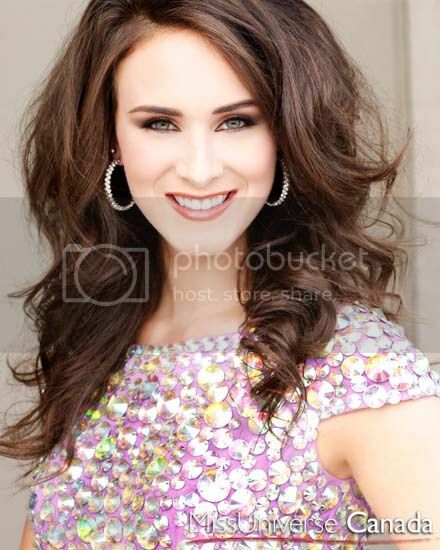 I just want to take this time to thank you for giving me this chance to be part of Miss Universe Canada! It is truly an honor.